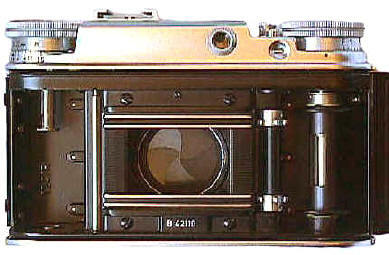 Few cameras have the Prominent's weird combination of First class construction, finish, and optics, and third rate design. The Prominent was intended to compete with the very best, and it did in terms of finish and optics. But it really didn't, because it was a bad design to begin with. 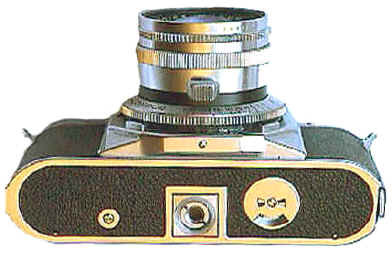 It is a large heavy camera, slow and awkward to use. 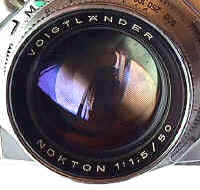 Voigtlander should have known better than to try to compete with Leica etc with a leaf shutter camera. 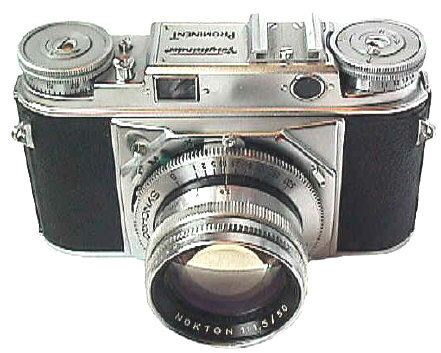 The leaf shutter placed lenses farther away from the focal plane, ensuring Voigtlander's best could never compete with the faster or wider lenses of Leica, Nikon or Canon. Foolish Voigtnicks. The Prominent I shown here was made from 1952-58. Towards the ends of its production it gained a lever advance. 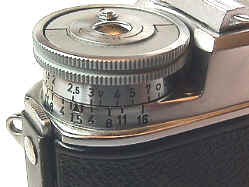 It was followed up with the improved Prominent II of 1958-60, with a very large Albada finder with framelines, and lever advance, built on the same basic body. Today the Prominent II is a rare and sought after collectible, but the quality of its Albada finder is pretty miserable compared to a Leica M, and very prone to flare on top of that. In other words, it is not a wise choice as a classic shooter if you are starting from scratch and paying retail prices. A freebie from Uncle Lewie or the local thrift shop is another matter, of course. 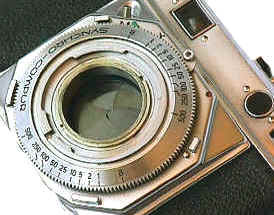 Prominent lenses were rather limited: 35/3.5 Skoparon, 50/3.5 Color Skopar, 50/2 Ultron, 50/1.5 Ultron, and 100/4.5 Dynaron. 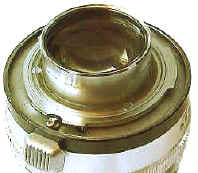 There is also a rare reflex housing with 100/5.5 Telomar. Today, all Prominent lenses and accessories are hard to find. Even if you do find them, your system is far below the level of usability of the Leicas, Canons and Nikons, or even of the much lower priced Kodak Retina IIIS. Why bother?? Geez, have you ever seen a prettier tripod socket? Interestingly, you focus the camera with the knob on the left that looks like a rewind knob. The Voigtlander 50/1.5 Nokton was one of the very best fast lenses of the 50's, even a good performer by today's standards. 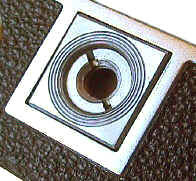 In Leica mount, it's very sought after and hard to find. Wow, what a baseplate! 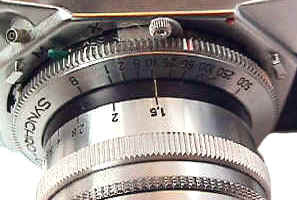 Voigtlander had an attention to small details which just escaped everyone else. Their leather works, camera and lens cases, are clearly far and beyond everyone else in terms of quality--better than even Leica and Zeiss. Hmm. Perhaps they spent too much time on the little picture and didn't notice the big picture of not selling enough cameras to stay in business.